We just finished our summer Vacation Bible School last night. Several children and their families turned out for the closing program. 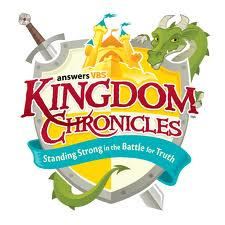 I am so grateful that our pastor chose Kingdom Chronicles, put out by Answer In Genesis. It was a great week! The castle theme was fun, of course, but more importantly the teaching from God’s Word about how to prepare for daily living was solid and practical. Based on the armor of God passage in Ephesians 6, children age 4 – entering 7th grade learned how to be strong in God, the King of Kings. I love the music in this program! Most of the songs were written by Ron Hamilton, Jonathan Hamilton, and Buddy Davis. We didn’t purchase the soundtracks. I enjoyed serving as pianist, and I think it’s safe to say that all the children and adults were blessed by every song. We also didn’t purchase their craft supplies. Instead our pastor’s wife directed the craft making of a “stained glass window” with card boxes, transparencies, “jewels,” and markers. They turned out to be quite lovely. Last week several children chose to follow God’s kingdom instead of Satan’s kingdom. Please pray for us as we follow up with the families who participated. I’m so thankful we were able to be part of it, and I can’t wait until next year! What did your church do for VBS this year? Would love to hear about it below! To learn more about Kingdom Chronicles, click here.